in stretch fabric KS 2565 Kwik Sew 3055 New Look 6959 OOP Burda 8841 OOP? BurdaPlus pegged skirt: I added a seam allowance of 1.5 inches. That gives me an extra 5 inches to play with. The pattern pieces pinfit okay; I seemed to need only 1/4 inch extra for the front, but the patternease tracing paper is stiff, and the knit fabric I’m using is very soft. My hunch is that without extra ease, the fabric will mold itself to every lump and bump. KS 2565 t-shirt: I lowered the dart 1/2 inch before cutting. Tweak it here; tweak it there; will it ever fit perfectly? KS 3055 long sleeved t-shirt: DD wore the other one I made last week, and the sleeves were long, so I shortened them about 1/2 inch. NL 6959 skirt: I had to trace the pattern, first. I was hoping to get 2 skirts for her out of the last 14 inches, but she’s getting bigger, and I could only cut one. Burda 8841 – 2 t-shirts and 1 pair of shorts: It seems all doll clothes patterns are printed single size. I thought it was something Sewing For Dummies did to make things easier. I didn’t trace the patterns, since they are single size, and I’m not going to alter them. I tried to get 1 t-shirt, 1 pair of shorts, and 1 dress out of the scraps, but I didn’t have enough for the skirt. The bodice for the dress uses the same front as the t-shirt only shorter, so the babies will have one regular t-shirt and one cropped t-shirt. No sewing today. I had a class, tho. I signed up for the Artista embroidery class at Dublin Sewing Center. The class had been taught by 2 teachers, Kathy and Lisa. Kathy had to quit teaching, so, fortunately for us, Pat stepped in to replace her. They changed the format of the class. We had been making samples every class. Now, we will be alternating between learning about the software and learning about how to use our machines to embroider. This month we learned how to oil our machines and all about stablizers. The store gave us 25 different samples, and we talked about each one. It was very informative. Of course, I ended up getting a roll of the water-soluable paper like stablizer. I retook the picture. The camera is looking up at me, so it’s not the best angle, but I did get the timer to work. The t-shirt isn’t that bad. It’s just not as good as Kwik Sew 2565 on me. On the left is another image with the t-shirt tucked in. After having worn the top, I decided it was better than New Look 6143 but not as good as Kwik Sew 2565. See Pattern Sizing for comments on fit. Oh, and I decided the funneling neckline wasn’t that bad. 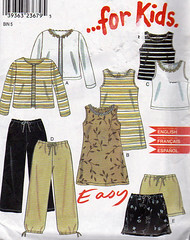 Pattern Description: A yoked, french dart T-shirt in plus sizes. Burda 44-52. I made a 46, had to add 1 inch to the bust width, and it’s very roomy. I’d say it runs large, but perhaps it is supposed to have lots of ease. UPDATE: The top does run big. It slides off my shoulder; you know the feeling: “the neckline is cutting into your neck and one bra stap is showing” feeling. I should have trusted my judgement when I was altering the pattern; usually I have to add 2-3 inches for the bust dart. In this case, I only had to add 1 inch, and I think that difference should have clued me into the large shoulders and large back. I recommend cutting a size smaller. For all that the model is slender with a small bust and I am about 60 pounds overweight with a very large bust, the model and I looked almost exactly the same, shapewise, in the tshirt. Yes. I think I followed the instructions. It’s a t-shirt, so at a certain point, I used my experience, not the directions. I wanted to make this t-shirt because I was curious about the french dart. I thought it might be a way for me to get more shaping in a shirt, but still have room for my hips. My breasts are so large, that if I don’t do something to pull things in at the waist, I look much, much heavier than I am. I think the t-shirt runs large. When I was tissue fitting, I only had to add 1 inch to the width. I usually add 2-3 inches. However, the shoulders fit well. Perhaps, I just don’t like all the ease that is present in plus designs. I don’t usually make plus designs because when I look at the pictures, they have so much ease they look like shapeless sacks to me. So while I’m still intrigued by french darts, this particular design is not my favorite. The french dart was very easy to alter. I think I used a 1/4 inch seam allowance (I was sewing a Kwik Sew tshirt with this one) on the neckline instead of the 5/8 inch that I put in the pattern pieces. The neckline funnels up. I decided to leave it like that. Uh, I mean, of course, I deliberately changed the design to have a funnel neck. More of that pink with blue flowers print in cotton lycra knit. I was told it was a swimsuit fabric when I bought it several years ago to make a nursing top. I increased the french dart to have room for the gigantic ones, and I left off the yoke. I don’t think I’ll make it again. I like my Kwik Sew 2565 t-shirt. I might take the neckline (w/o the funnel effect) and the yoke and make a KS2565 with those changes. An intriguing dart option that didn’t do what I was hoping for, but the shirt did come out looking almost exactly like the one in the picture, so I’m not sure why I expected something else. The Girls’ Tops are designed for stretch knits only with 25% stretch across the grain. 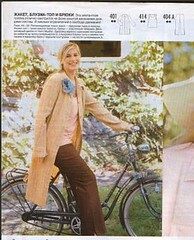 Kwik Sew suggests interlock, textured knits, stretch velour, pointelle jersey or thermal knits. The pullover top has a neckline finished with self fabric binding. 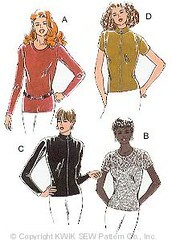 View A has long flared sleeves, View B has short sleeves, the bottom edges of the tops and sleeves can be hemmed or finished with lettuce edging. I made both the long sleeve and short sleeve versions. Girls 4-7. I made a size 4 based on DD’s height. It seems to fit. She’s very slight. Yes, I didn’t do the lettuce edging. I didn’t follow them. I’ve made a lot of t-shirts, and I used the same methods on this one that I would use on a t-shirt for me. LIKE: The pattern is streamlined. No extra marking. LIKE: The pieces fit well together. LIKE: The 1/4 inch seam allowance is wonderful with my serger. LIKE: The heavy paper that the original pattern is printed on. It’s well printed and easy to trace. LIKE: The bell sleeves are very trendy right now. A pink with blue flowers, cotton lycra knit, print that has been aging in my stash for at least 2 years. I didn’t follow the cutting instructions. I wanted to use up the 33 inches of this knit (60 inches wide) on 3 t-shirts, so I squeezed things in. 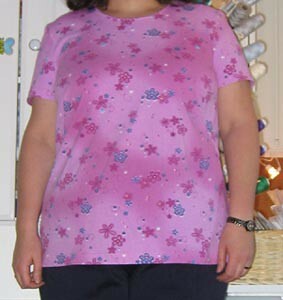 I was able to cut, in size 4, one short sleeve t-shirt, one long sleeve tshirt, and one tank top from another pattern. I used a glitter blue fold over elastic on the short sleeve t-shirt. DH likes the neckband better. DD hasn’t commented. I used the regular hem on the sleeves. I plan on making DD several more tshirts this spring. 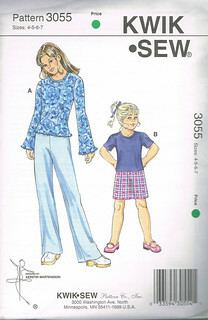 Kwik Sew tshirt patterns are excellent patterns, and I recommend all of them. 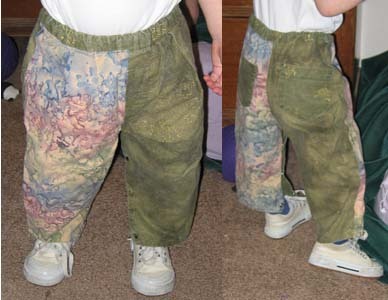 I had traced these pants last spring in a size 50 which is now a size too big. However, since they are pants, I decided to go ahead and add the seam allowances and pin fit them in this size. We’ll see. If they truly are too big, I can retrace them in a 48. I plan on using a solid blue cotton/lycra knit. I traced the skirt in a size 48. I love straight skirts. This one is very pegged. I’m not sure how I feel about that. We’ll see. I have 2 fabrics pulled. The blue cotton/lycra mentionned above, and a blue & brown print polyester knit. It has a fuzzy surface. I don’t know the name of this sort of knit. Very cute toddler clothing. I made the pants. Labeled as 6 months – 4T, but they don’t give measurements. They do say in the patterns that the sizing is one size larger than rtw. I made the 12 months size, and it fits my size 18 mo to size 2T son very well. They never fit my daughter who is very, very thin. Yes. I left off the cuffs and used 2 fabrics for the side shown. The pants are reversible. 1. It was easy to do the back pockets, and I had not placed patch pockets on any sort of garment. 2. I did something wrong when making the pants. They are supposed to be revesible without snaps. Mine aren’t. That is, I made mine (accidentally) to be reversible using snaps on the legs for diaper access. So the inner leg seam was finished before sewing the legs together. My hunch is that I misread the instructions. I’m dyslexic, and I was a beginner clothing sewer at the time. LIKE: The clothing comes out so very cute. DISLIKE: There isn’t anything that I dislike about this pattern. I haven’t made the pants again, but I love the vest and have made it many times. Cotton broadcloth scraps left over from making nursing tops. Well, the happy accident of the snaps for the inner thighs was a design change. I might make them again. They didn’t fit my daughter, but they fit my son. I do recommend it because the clothing comes out so cute, and like I said above, I absolutely love the vest pattern. Fun, cute clothing for babies and toddlers. I finished serging all the seams. The only thing left to do is hem. NL 6959 tank top is completed. I tried coverstitch in the round using Bryden’s instructions for ending the coverstitch. It worked wonderfully. I did have some trouble going over the seams. The Elna 744 really doesn’t handle bulk very well during coverstitch. I tried on the t-shirts. The bigger sleeve makes a huge difference in the KwikSew tshirt. I’m not thrilled with the Burda Plus tshirt. I’m not sure why. It came out looking almost exactly like the one in the magazine. I was hoping that it looked big and sacklike on the model because she wasn’t a plus sized model and that while I filled out the shirt more than the model, the french darts would give me some shaping and definition at the waist. The KS t-shirt is much more flattering. I, probably, should follow Sherril’s example, and stick with the tried and true pattern. I like trying new patterns, tho. I wonder what would happen if I put the french darts in the KS tshirt?